Amongst a storm of new releases in the Side-by-Side world and the race to 1000cc, Kawasaki has been out of the spotlight by comparison. But while Kawi is probably years away from 1000cc’s don’t think that they aren’t capable machines. In the grueling 2014 Griffin King of The Hammers UTV race the Teryx was the only non-RZR to even finish taking 3rd in the Pro class and 2nd in the Sport class. The Pro class ride was a Teryx4 and the Sport class entrant was nearly stock! 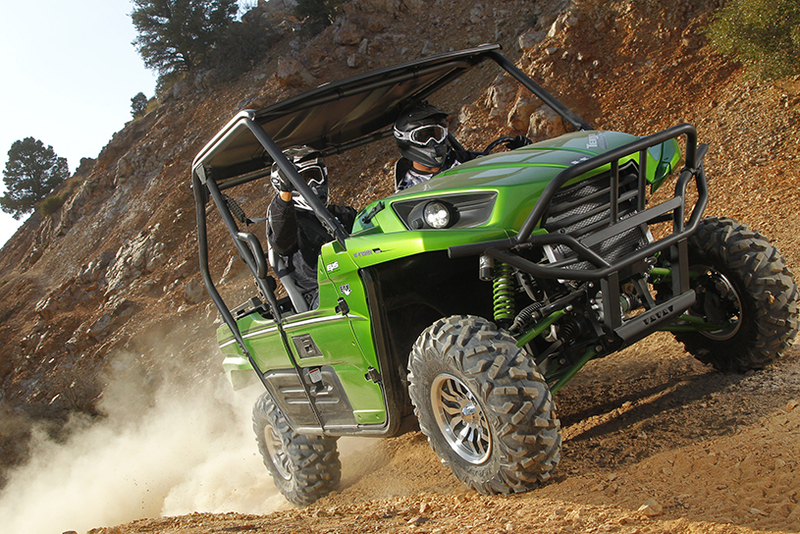 So let’s take a look at the 2014 Kawasaki Teryx lineup. 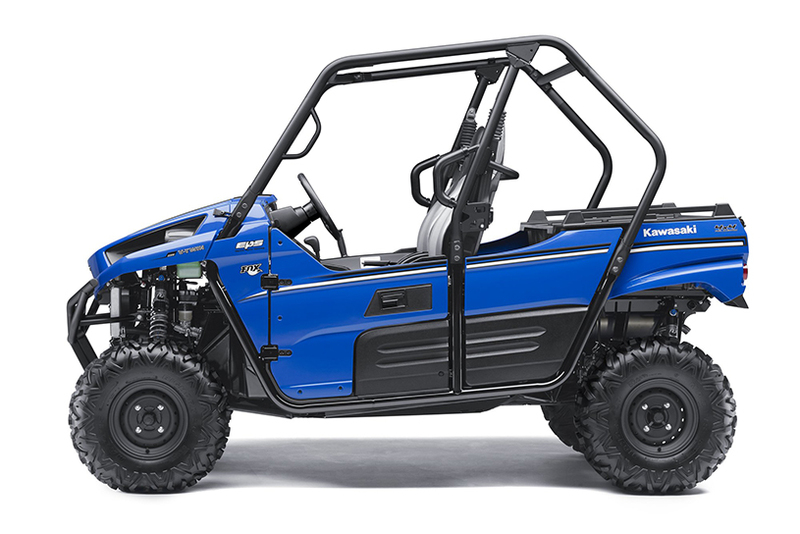 For 2014, Kawasaki has 3 models of the Teryx. 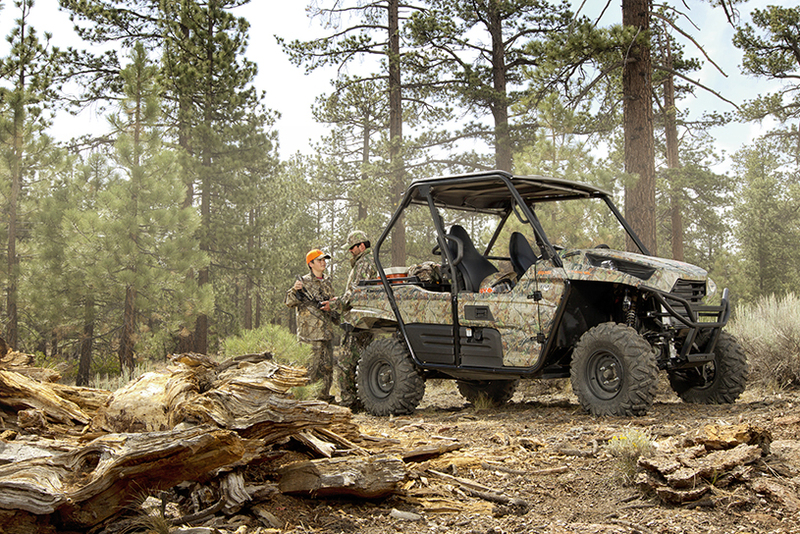 You can choose from the base model at an MSRP of $12,999, the camo model for $14,299 or the LE model for $14,999. Surprisingly the list of differences in the 3 models is as short as the price difference between them. Maybe that’s because the base model is just that well loaded. Each model starts with an increased 783cc, liquid-cooled, 90 degree, 4 stroke V-twin engine. It’s paired up with Direct Fuel Injection (DFI) through two 36mm Mikuni throttle bodies. The transmission is a CVT with high/low range and a wet centrifugal clutch. All 3 models are also equipped with reservoir coil-over FOX Podium shocks giving 8 inches of travel in the front and 8.3 to the IRS in the rear. They measure in at 117.3 inches long, 61.6 inches wide and between 74.8 and 76.8 inches high, the base model being shorter. All have 11.1 inches of ground clearance and an 85.8 inch wheelbase. The trio is finished out with Electronic Power Steering to point the 26″ Maxxis Bighorn tires exactly where you want them. Other notable changes for 2014 include a new frame and cage design, improved door latches and changes to the body design. All of this is backed by the Kawasaki Strong 3 year limited warranty. So what do you get for the difference in price? Naturally the camo edition upgrades the base model’s Vibrant Blue color to Realtree APG HD camouflage. It also upgrades the headlight system to LED and adds a hard plastic roof. The Teryx LE gets the same LED headlights and roof but trades the Realtree APG HD camo for Candy Lime Green or Candy Burnt Orange including painted shock springs and A-arms. The LE also gets fancy seat covers and polished aluminum wheels. 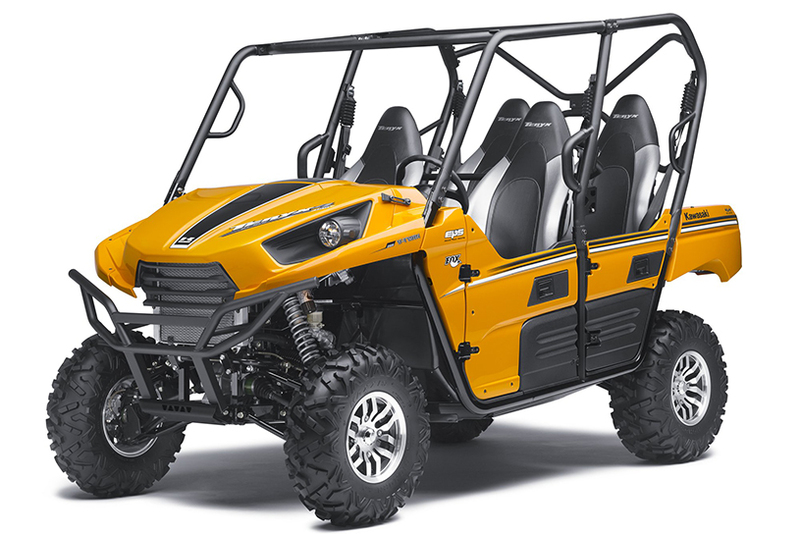 Similarly, there are three 2014 models of the four-person Teryx4. The base has an MSRP of $15,799, the camo edition at $16,299 and the LE will set you back $16,999. The specs are almost identical except for the obvious changes in dimensions. Length is stretched to 124.8 inches, and height goes to 77.3 for the base and 79.4 for the camo and LE models. The wheelbase changes unnoticeably to 85.7 inches. The base model trades the Vibrant Blue paint for Sunshine Yellow. The other model upgrades match those of the 2-door version mentioned above. It’s obvious that Kawasaki doesn’t need to be concerned about printing a 4 digit engine size in their brochures. The KOH finishes alone prove that the Teryx is built to last through more in 8 hours that most rides will be put through in their lifetime. 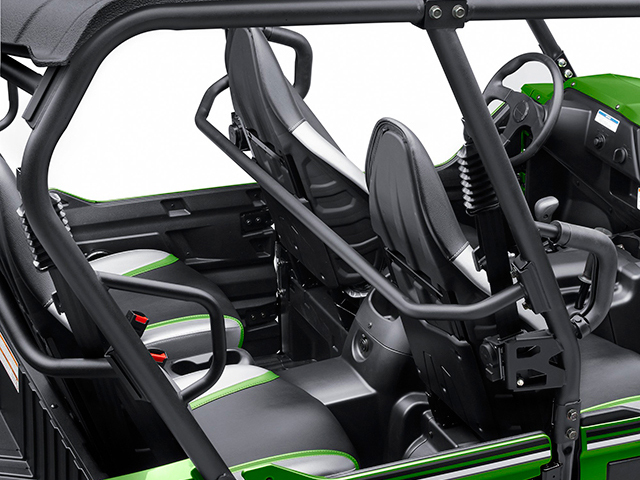 To see more information on the 2014 Kawasaki Teryx check out http://www.kawasaki.com/. This entry was posted in ATV Review and tagged 2014, Kawasaki, KOH, racing, Teryx, Teryx4 by charlie. Bookmark the permalink.